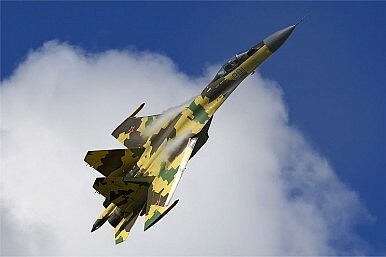 China’s air force has indicated it’s interested in buying the Su-35 fighter from Russia. What does Russia think? China is executing an ambitious defense modernization plan designed to make the country militarily self-sufficient by around the 2020s. So with a range of domestic fighter aircraft development programs in train – including the stealthy J-20 – it seems that buying new fighter jets from Russia probably wasn’t part of that plan. Nonetheless, the Chinese have asked Russia to sell them the new Sukhoi Su-35 “Super Flanker” fighter aircraft, according to Alexander Fomin, deputy head of Russia's Federal Service for Military-Technical Cooperation. Cited by the Russian media, Fomin said that Beijing had filed a request for the S-35s – as well as S-400 air defense systems – back in 2011. China isn’t transparent about defense procurement, so nobody knows for sure whether buying the Su-35 has always been part of its strategy, or whether it’s an admission of failure. But it’s been a decade since China has ordered any foreign jets – Russian Sukhoi Su-27s and Su-30s – for the People’s Liberation Army Air Force (PLAAF), leading many aviation analysts to conclude that the Chinese would only return to the international market if they had no choice. Now, with both India and Japan ordering advanced new fighter aircraft, the PLAAF may have determined that it needs the new Russian jets as a stopgap while the Chinese aerospace industry continues to work through some critical technology challenges, notably aircraft engines and radar systems. By ordering the Su-35, China’s defense planners would essentially be demonstrating that they aren’t willing to gamble on the J-20 and the other advanced planes that the Chinese defense industry is working on. Russia’s motivation is also complex. The Su-35 is a new aircraft that hasn’t yet entered active service with the Russian Air Force, and the Russians are reluctant to sell it to the Chinese because of their track record of reverse-engineering earlier model Sukhois and then churning out copies. Equally, the Russians are aware that the day is fast approaching when China will no longer need to import Russian defense technology, and they may be eyeing the Su-35 sale as a last hurrah in the Chinese marketplace. If China really is interested in ordering the Su-35, Moscow will certainly be wary of Beijing’s rationale. It won’t want to sell the Chinese only a handful of aircraft, just so that they can clone some of the Su-35’s fanciest technology, in particular its advanced radar set. It will be looking instead for a serious commitment for the procurement of several squadrons. The acquisition would make good sense for the PLAAF: the Su-35 would be the most effective aircraft in its inventory and serve as a powerful force multiplier. At the same time, it would be a setback for China’s self-sufficiency drive, and an admission that the dream of total self-reliance is still some years away from being realized. China is busy recasting itself as a defense exporter, rather than an importer. But the need for an advanced frontline fighter like the Su-35 might force Beijing, just this once, to break its own rules. Should Russia sell Su-35 to China? China has been accused of copying Russian fighters. So why does Moscow seem close to selling it the Su-35?